Sprint undertook this project to create a facility to test and evaluate equipment for the deployment of their 4G wireless network. The project included 17,000 sq. 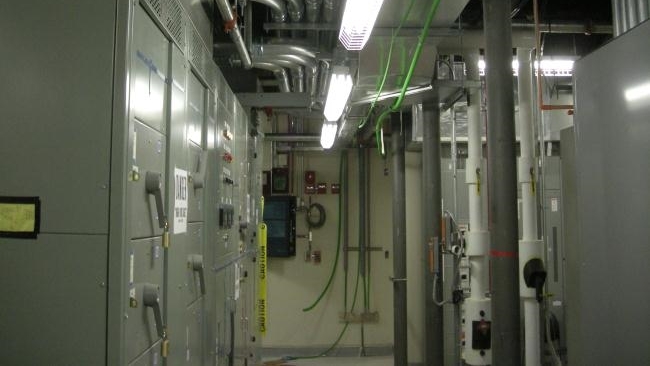 ft. renovation comprised of electronics lab, DC power plant, RF testing chambers and UPS room. Design challenges included: a compressed schedule requiring use of existing on-site UPS and generator facilities for the Phase 1 deployment and integrating the existing facilities into a long range plan, pre-purchase of long-lead equipment, and low ceiling heights in the lower level. - New 3000-amp, 277/480-volt electric service. - 2000 kW standby generator. - 500 kVA un-interruptible power supply. - 10,000-amp DC power plant. - 200-ton air conditioning system in N+1 configuration. - Integrated Building Automation system. - High Sensitivity Smoke detection. - FM 200 gaseous fire suppression system.